The last few generations of settlers on Turtle Island have perhaps the weakest ever connection to the land. We can trace this disconnection back to colonization and to our presence here as settlers. So far in this series, we’ve identified dominator ecology with colonialism and seen how it views humans as separate from the ecosystems they live in. In cultivating an anarchist ecology then, we begin by building a real relationship with the land. This article is part of the series Towards an Anarchist Ecology. Building relationships is rooted in the idea of radical inter-connectivity. We are a part of the natural world, and our healths are tied together with those of the creatures, plants, natural systems, and rhythms of the specific places around us. Humans belong to ecosystems, we depend on habitats, we inhabit watersheds – there is no separation between us and the land. And so we need to open ourselves to joy and humility. An anarchist ecology requires a playful spirit and the humility to let go of the need to know and have answers. Questions and wonders lead to more questions – our senses open to natural rhythms and we notice more details of the world around us. By emphasizing questions over answers, we deepen our relationship with the land without the baggage of being an expert. Seeking a connection with the land also means confronting our settler identity and the carnage of colonialism. That history is written on the landscape. We cannot truly know the land without hearing its story. And when we listen, we know that the hurt is deep. This deep hurt can be scary, making it hard to break through our alienation from the natural world. Building a relationship with the land involves embracing pain and discomfort, it involves grieving. It means opening our eyes to the on-going violence of this culture and situating ourselves within it. Relationship building is much more than identifying by name. It’s about careful, close attention over time. A few years back, we found a tree that we hadn’t seen before. The tree’s bark was smooth and grey, with small lenticels flecked in horizontal bands. 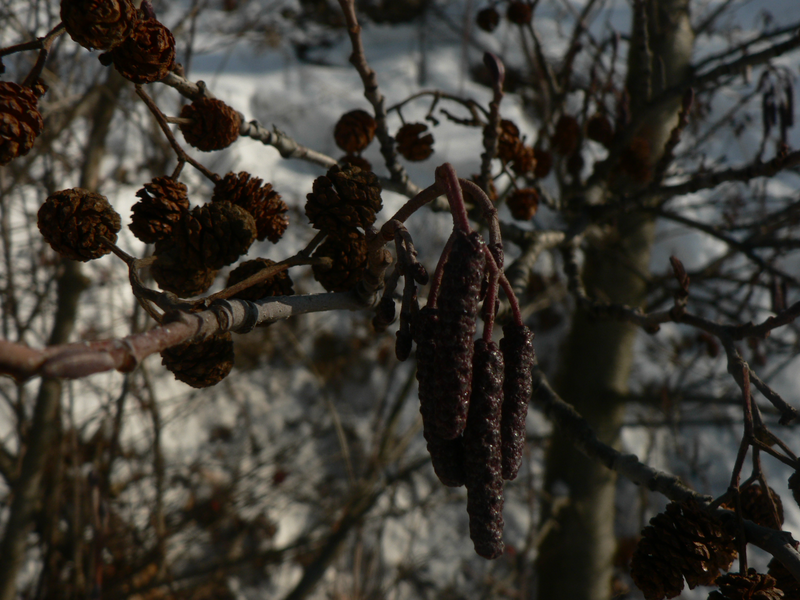 Despite the winter winds, the tree was holding tight to an amazing collection of little hanging cones and deep purple catkins closed up tight. As we walked the frozen shoreline, we noticed more and more of these trees and saw that they enjoyed having their roots right in the marsh. 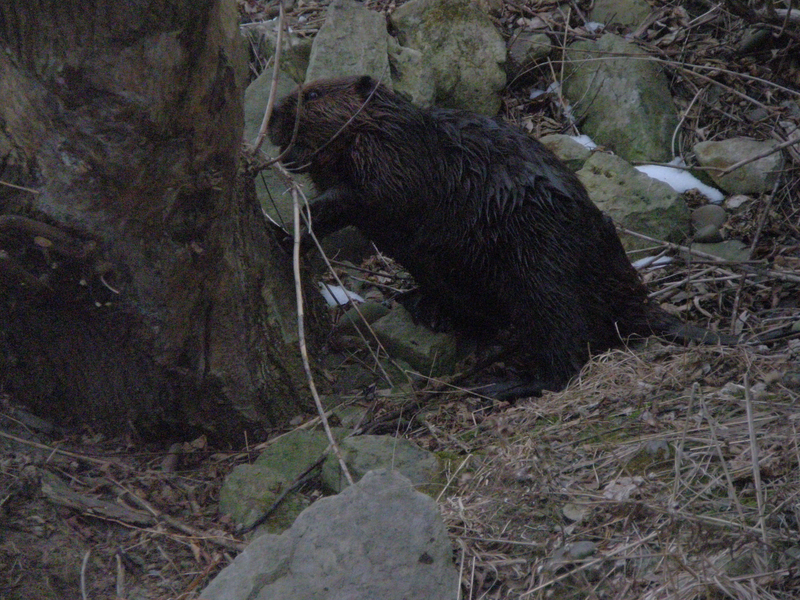 And, judging by the number of neatly cut stumps, it seemed the beaver liked this tree most of all. Returning to those shores over time, we became more and more eager to watch this tree. 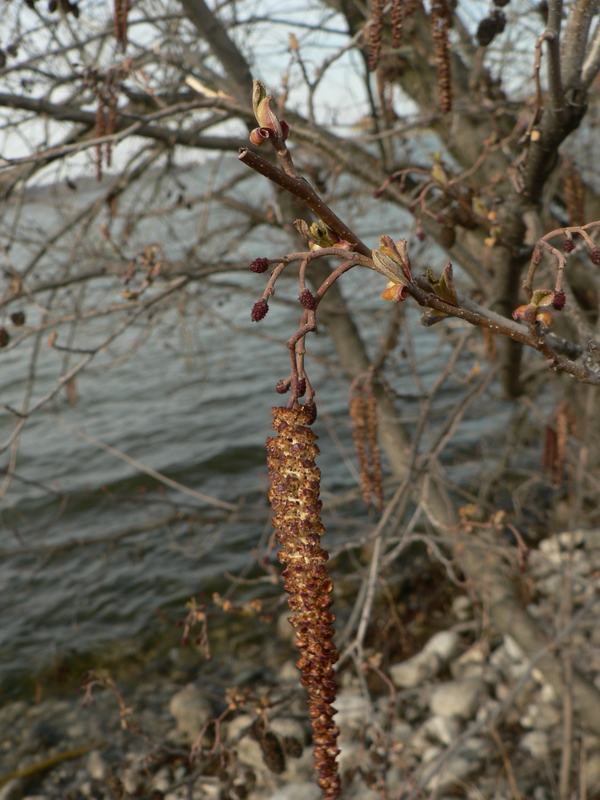 In spring, it was the first to drop long, yellow catkin flowers and send pollen on the wind. The small flowers develop into woody cones over the summer, and in the fall they open and release a winged seed. Much later, we came to learn it was an Alder, but even in not knowing its name we already knew so much about it. Most of the alders we know are european Alders, and they offer a pretty healthy reflection for settlers like us to think about what it means to join a forest community and contribute health and healing. Right now, we are growing hundreds of baby Alders because they are so important in adding health as nitrogen fixing trees. We excited to continue getting to know this tree. We can’t really tell you what it’s like to build a relationship with the land in a theoretical essay, all we can do is describe what it involves. We could talk about watersheds, bird migration, the Nanfan treaty or the draining of the wetlands, and these are all important facts. But building a relationship is a process, an experience, and not a list of facts or conclusions. How do we suggest moving forward with this work? What are some tools we can use to build a relationship with the land? The next article in this series is called Deep Listening, and we will be releasing it in the next few days. But we want to hear from you first. What have your experiences been in building a relationship with the land? What is it like to come into contact with the violence of colonialism as you do? Is it challenging to learn to trust in your own experience?